Eleanor Oliphant is completely Fine is one of those exceptional, unsettling and ultimately uplifting novels a reader never forgets. It’s a special novel that made me feel a multitude of contradictory and strong emotions; optimism, devastation, shock and joy, but overall enthusiasm and positive energy. Eleanor is definitely not fine. The reader will walk in her shoes and gradually discover why she’s not fine and what, if anything, she can do about it. Eleanor is a unique and engaging narrator. She’s honest, naive and very lonely, and at the beginning she’s also insensitive and infuriating! She’s hard-working and efficient, but lacks social skills, because she’s physically and emotionally scarred. There’s a dreadful reason for her detachment from others, which the reader suspects and is very gradually unveiled throughout the compelling narrative. There are some twists in the story, mainly due to Eleanor’s unpredictable actions and reactions to events, but my main reason for turning the pages avidly was because I cared about Eleanor and hoped she would find a way to recover from her agony and alienation. In spite of the traumatic subject matter, it is an optimistic novel of hope, love and second chances. There is a great deal of comic relief, too, and a touching romance. Eleanor is able to start moving on thanks to the unexpected friendship of a colleague and a wonderful case of serendipity. Sammy is an endearing character who has a short but vital role is Eleanor’s awakening and recovery. Eleanor and Raymond are unforgettable characters brought to life in a unique and beautifully narrated, heart-wrenching story with an uplifting ending. I can’t stop recommending it to my friends. According to Deadline.com Reese Witherspoon’s new company Hello Sunshine has set up to produce Eleanor Oliphant Is Completely Fine. 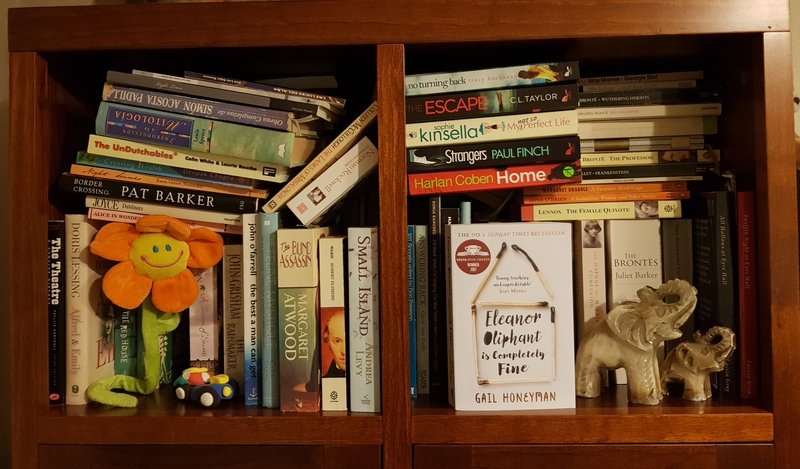 I listened to the audio version, which I really enjoyed, and now I have my paperback copy on my proud bookshelf, ready to be enjoyed all over again, because Eleanor Oliphant is completely fine is a truly wonderful novel to be read and reread. it is a lovely book, isn’t it? Glad you enjoyed it too! I think Gail should write a sequel. There’s a lot more to know about Eleanor and Raymond.. I really like the sound of this audio book, Luccia. Thank you for sharing. The audio book is fabulous. I think I saw somewhere on Twitter that it was being read, by the same reader, on radio 4. I loved this book – recommend it to everyone. A fresh, fabulous read … I love how they all saved one another, just brilliantly uplifting in so many ways. Absolutely! I can’t imagine anyone not loving it.